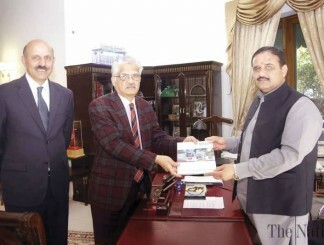 ISLAMABAD – A delegation of Pakistan Electronic Media Regulatory Authority (PEMRA) led by its Chairman Muhammad Saleem along with Executive Member Ashfaq Jumani called on Chief Minister Punjab Sardar Usman Buzdar. The Chairman presented PEMRA’s Performance Report for the FY 2015-18 to the Chief Minister. During the meeting, the Chairman PEMRA discussed various issues related to electronic media industry in Pakistan and expressed his full resolve to play constructive role to address all issues in coordination with Punjab Government. The Chairman acknowledged the efforts of the Punjab Government in ensuring a conducive environment for electronic media in Punjab and steps taken for the betterment of media industry. The Chairman extended his indebtedness to Chief Minister for cooperation of Punjab Government with the Authority in implementation of regulatory affairs. The Chief Minister Punjab urged that PEMRA should play an active role in discouraging fake news. He appreciated PEMRA’s Report and expressed that its publication would be beneficial for the industry. The Chairman PEMRA was accompanied by Director General (Operations Broadcast) Sohail Asif Ali Khan, General Manager (Operations/Media PR) Muhammad Tahir and Secretary to Authority, Fakharud Din Mughal.